Look at my wattage from last night’s commute. What I would like for you to notice is that my Average Power was up a whopping 24 watts but my Normalized Power was only up 5 watts from 249 to 254 watts. Why is that? 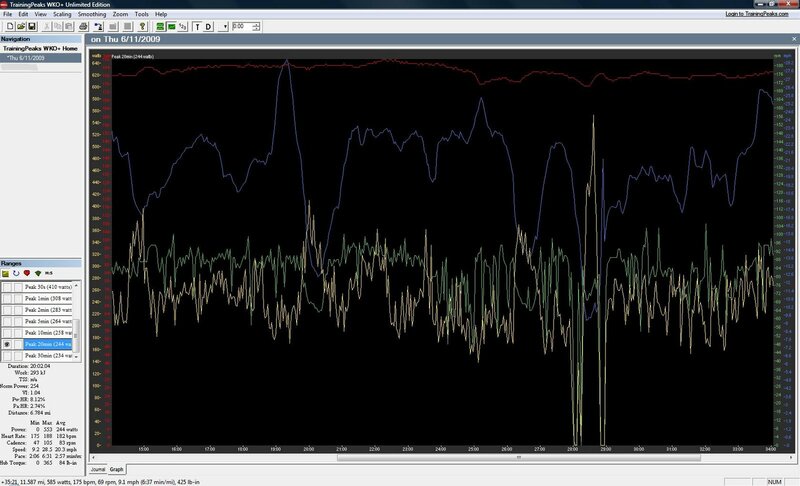 TrainingPeaks uses a special algorithm to calculate an adjusted or normalized power for each ride or segment of a ride (longer than 30 seconds) that you analyze. This algorithm is somewhat complicated, but importantly it incorporates two key pieces of information: 1) the physiological responses to rapid changes in exercise intensity are not instantaneous, but follow a predictable time course, and 2) many critical physiological responses (e.g., glycogen utilization, lactate production, stress hormone levels) are curvilinearly, rather than linearly, related to exercise intensity, By taking these factors into account, normalized power provides a better measure of the true physiological demands of a given training session – in essence, it is an estimate of the power that you could have maintained for the same physiological “cost” if your power output had been perfectly constant (e.g., as on a stationary cycle ergometer), rather than variable. Keeping track of normalized power is therefore a more accurate way of quantifying the actual intensity of training sessions, or even races. In other words, when you apply power to the pedals it takes time for your body to react and when it does it reacts on a curve not in a straight line. Normalized Power takes this into account. So back to my ride from last night. Notice how the POWER line is more erratic with rollers and traffic signals. Compare it to this morning’s ride was not as variable the power was more consistent so the Normalized Power only increased by 5 watts from 249 watts to 254 watts.